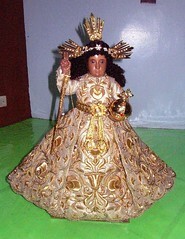 The venerated image of the Child Jesus in Pandacan, Manila, Philippines. In ca 1600, several children were playing beside a carabao den in the middle of the pandan plantation close to a small lake (lubluban). While they were playing, they discovered a beautiful image of a child beside the lubluban. They were delighted to find a doll which resembled their features. With much excitement, they informed their parents and the town elders about the said doll. Without any time to waste, the elders went to the site and saw the image. They discovered that the beautiful image that the children found wasn't a doll but the Sto. Niño, the patron of Pandacan. The townsfolk informed the Franciscan friars that resided at the Sampaloc Parish because those friars were the ones assigned in handling the pastoral care of Pandacan then. The image was brought by the locals to the Sampaloc church to be taken care of and for people to venerate. One day, the image mysteriously disappeared from the Sampaloc church. Strangely enough, the Sto Niño was later found back at the lubluban and was brought back to the Sampaloc church. This happened several times. The Sto. Niño kept on disappearing, but was always found at the lubluban later on. The Franciscans finally realized that the Sto. Niño wanted to remain beside the lubluban in Pandacan. So, they decided to build the image a small "Visita" (chapel) on the exact site where He was found. They also developed the lubluban into a well to make it usable for the people who lived there. Still, the mystery of Sto Niño de Pandacan never ceased. After the parish was formally established in 1712, there were several miracles attributed to the image. One of the first miracles was the story of Doña. Josefa Andrade who was cured from her paralysis after taking a bath at the well. Since then, more and more miracles happened through the intercession of the image and the water coming from the well.